BRAND NEW HOME. 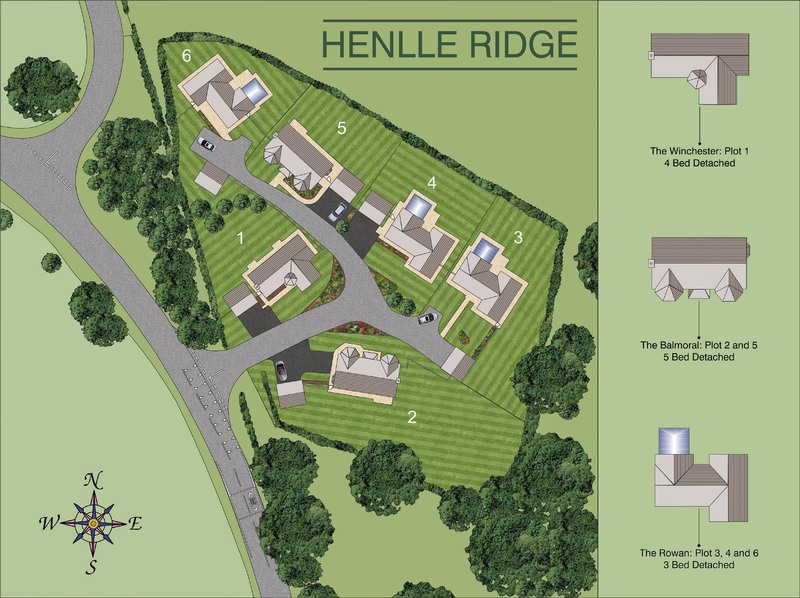 A substantial five bedroom detached detached house to be built on a prestige development of just 6 new detached houses and bungalow. The property is due for completion in mid 2020 and will be built to a high specification with the latest building and insulation standards. KEY FEATURES: Generous plot with double garage. 28ft lounge with chimney flue. Snug. Dining room. Fitted kitchen / breakfast room. Utility room and cloakroom. Master bedroom with en-suite having both shower and bath. Bedroom two with en-suite shower room, Five bedrooms in total. Main bathroom with bath and shower. 10 Year New Build Warranty. Entrance Hall: - Glazed entrance door with canopy porch over. Staircase to first floor. Door to cloakroom. Lounge: - 8.84m x 4.33m (29'0" x 14'2") - Bay window to front, double French doors to patio at rear, chimney flue. Dining Room: - 4.65m x 3.85m (15'3" x 12'8") - Bay window to front. Kitchen / Breakfast Room: - 6.86m x 4.89m (22'6" x 16'1") - (Overall measurement) Choice of fitted kitchen units, work surfaces and tiling. Built in oven, hob hood, dishwasher and fridge / freezer. Space for breakfast table. Utility Room: - 2.45m x 1.75m (8'0" x 5'9") - Fitted units and appliance spaces. Door to outside. Landing: - With gallery balustrade and window to front. Master Bedroom: - 4.76m x 4.62m (15'7" x 15'2") - Built-in wardrobes. 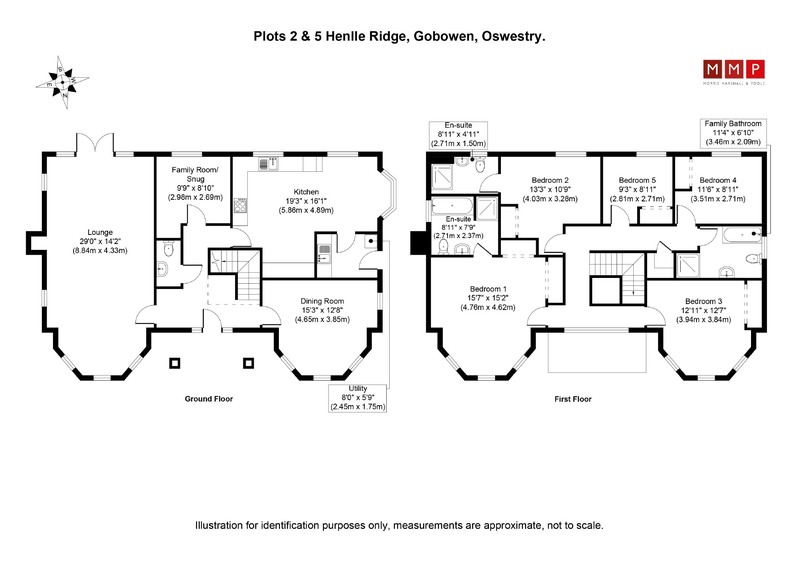 Master En-Suite: - 2.71m x 2.37 (8'11" x 7'9") - Suite comprises; hand basin, WC, bath and shower cubicle. Guest Bedroom: - 4.03m x 3.28m (13'3" x 10'9") - Built-in wardrobes. Bedroom 4: - 3.51m x 2.73m (11'6" x 8'11") - Built-in wardrobe. Bedroom 5: - 2.71m x 2.81m (8'11" x 9'3") - Built-in wardrobe. Main Bathroom: - 3.46m x 2.09m (11'4" x 6'10") - Suite comprises; handbasin, WC, bath and shower cubicle. Agents Ref: - Oswestry Office. 16 Leg Street, Oswestry, SY11 2NN. Ref: MM/013659. Date: 11/18.